Our industrial laminating machines are designed to add an adhesive paper on a flexible material. The glue paper will be laminated through a calendar system which will apply the pressure. Our range of industrial laminators are designed to produce lamination between flexible materials and adhesive glue paper. From a small width (600mm) to very large machines (width of 3500mm) our product range can provide you with the best solution for each application, and we are able to reach a production speed of 40 meters/min. Adhesive paper can be applied from top or bottom allowing the production of sandwich coating. 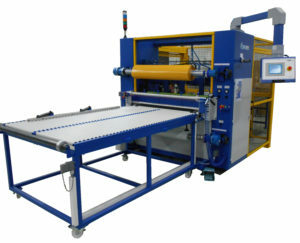 The laminator can be equipped with an inline cutting system or a tranversal cutting system to create sheets. The infeed material can be delivered on rolls or on sheets. The unwinding and rewinding units can be foreseen with expanding bars, pneumatic brakes, etc. It is also possible to add a hotmelt device to give the customer the possibility to create a complete hotmelt line. Our application fields are specific for soft material, and we can provide solutions with glue paper adhesive lamination or hot melt coating machines. Laminating equipment and converting machines can typically apply for foam with adhesive, carpet, non-woven, cork, adhesives, textile, and linnen. The typical market segments using industrial lamination equipment are the automotive, converting industry, and packaging.